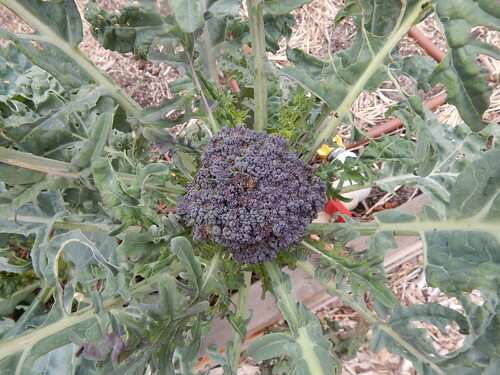 Given the lesson of the other sprouting broccoli, when the Purple Peacock Sprouting Broccoli started putting on a head, I took it off fairly soon. The head definitely has a purple cast to it, although I think it is really just a deeper, darker blue-green than normal broccoli. As you can see from this view, it doesn’t look nearly as purple up close. And then there is the caterpillar. 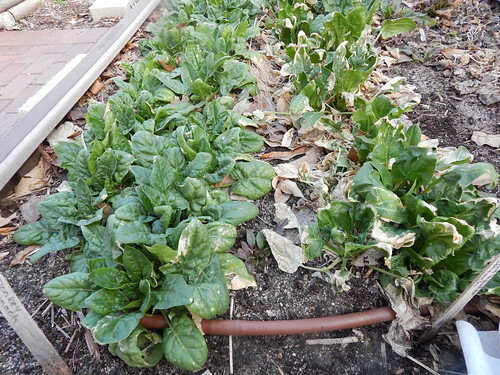 We haven’t treated for the cabbageworms recently, so I wasn’t surprised to see one. 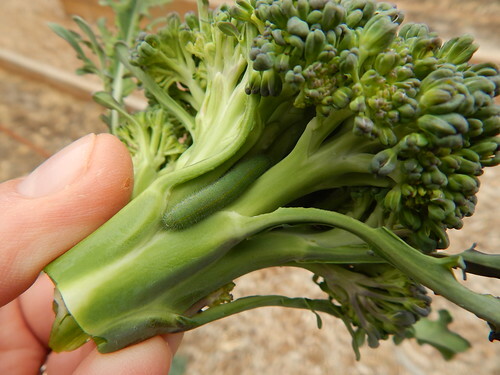 What was surprising is that I actually found six caterpillars in this small head of broccoli. Yes, that’s a lot. Yikes! This is what it looks like now, about 2 weeks later. You can see all the side shoots that have developed after cutting the main stalk. And yes, these are currently frozen solid. 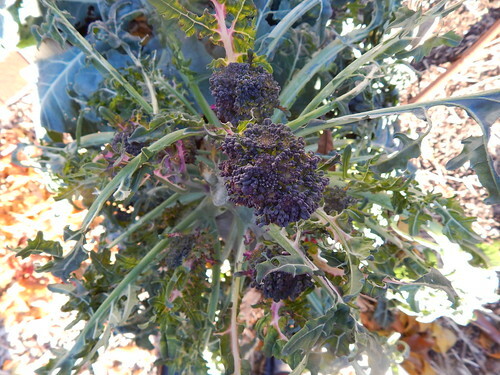 Here’s the green sprouting broccoli that I cut several weeks ago. It also has some nice side shoots growing. Once things thaw out, we may have to cut some of these. 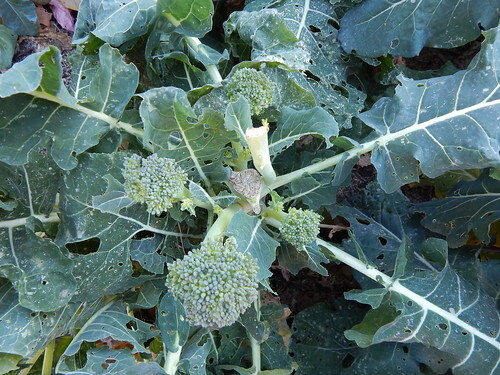 Broccoli is typically damaged once the temperature dips below 24, so I’ll be interested to see how these plants come out of the cold. What’s a Frost? What’s a Freeze? I saw this posted on Facebook this morning and thought it was really interesting! I thought I would sneak in with a PhotoEssay this week and then perhaps highlight some more new varieties next week. We are also having our first planning meeting next week, so I may have some things to report regarding our plans too! 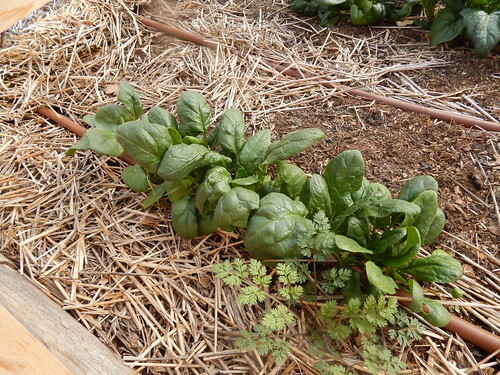 This is the spinach that is growing in our cold frame. It had been closed, but I opened it back up this week. Just in time for the rain, too! The plants that are on the end nearest the sidewalk are much larger, and I think it has to do with the amount of sunlight they are getting. 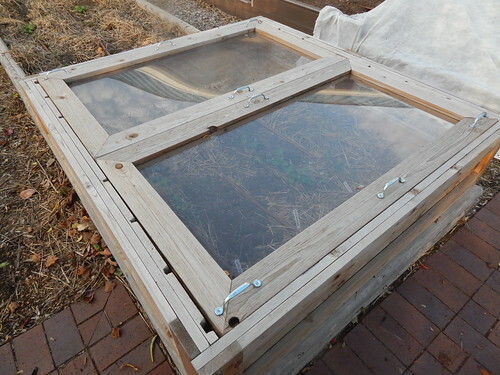 The plants on the other side of the cold frame get shaded by the wall of the cold frame. That would be the argument for either a plexiglass side on that end or for a shorter wall on that end. 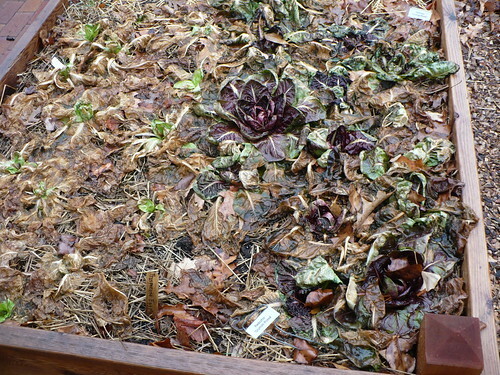 The overview of the radicchio patch looks pretty depressing. 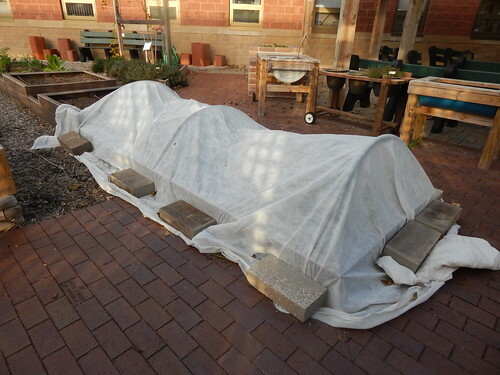 It obviously didn’t care for the cold temperatures of the past few weeks without protection. It is interesting though how distinctly you can tell where the green variety and red variety were planted. 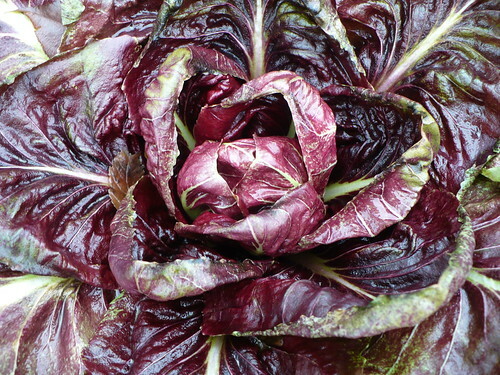 If you get down close to the red radicchio, you can see that some of the larger plants have tolerated the weather pretty well and are even starting to develop the heads in the centers. 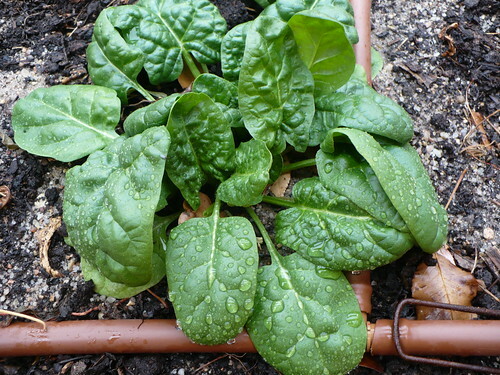 I’ll be interested to see if they survive through the winter and how they continue to develop. I pulled one of the ‘Red Beard’ onions just to see how they were doing. These are bunching type onions, so this is about the size you would expect them to be. 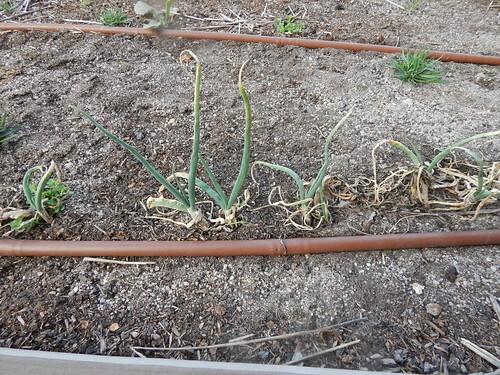 They are still doing quite well without protection, as are the shallots and garlic. 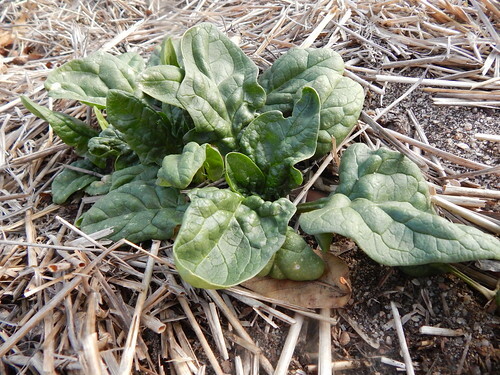 You can tell from the tips of the leaves that we’ve had some cold temperatures, but the plants are still healthy. 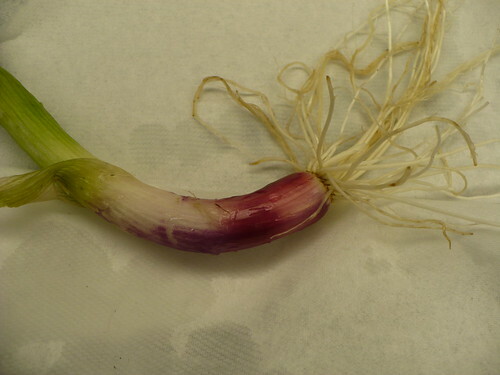 Did you know that you can eat the roots of onions like this? They are a little tough at this age, but you still get that nice onion-y flavor. 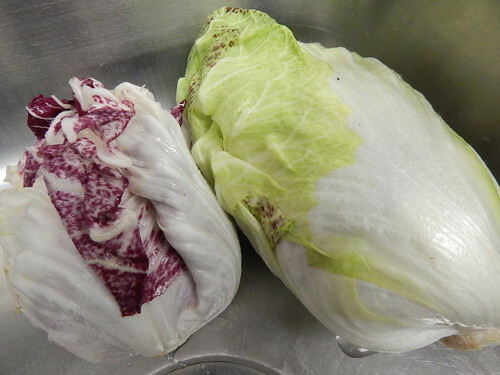 Maybe something interesting for a salad garnish? 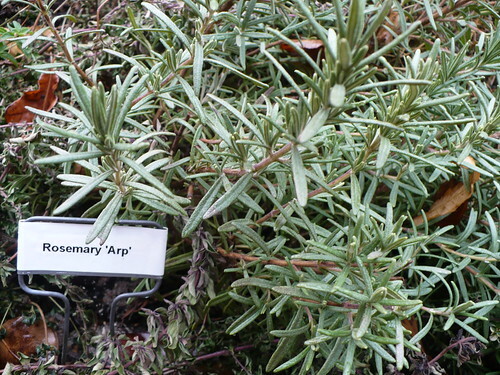 Last but not least is the rosemary. 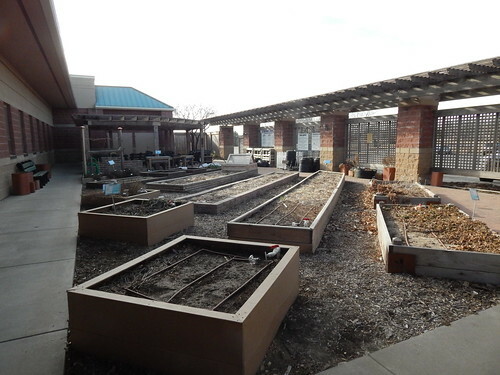 It is looking really good, even though most of the herbs are dead/very much dormant. 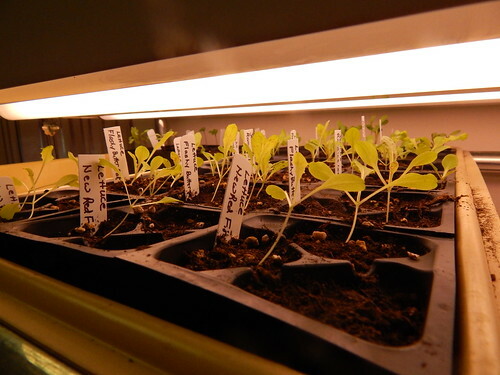 I expected the thyme to look better, but I think it is either not the most hardy of varieties or it had too much vigorous, young growth late in the season that has gotten zapped by the cold. It’s still alive, just not looking too tasty, especially compared to the rosemary. Speaking of Thyme, we will be highlighting thyme as our local Herb of the Year as well as Elderberry (the official herb of the Year) at Herb Day (May 4th) this year. Can you believe we have already started working on Herb Day?!? Yikes!